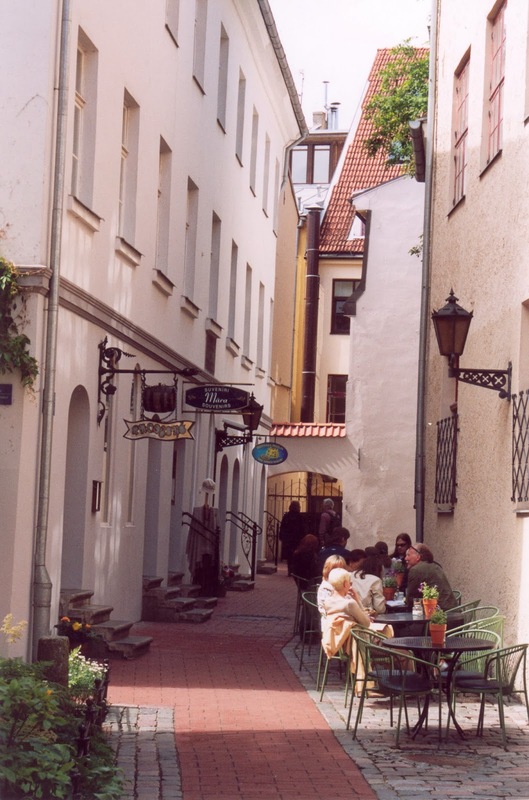 In the summer of 1999, I visited the Baltic State of Latvia in north-east Europe. 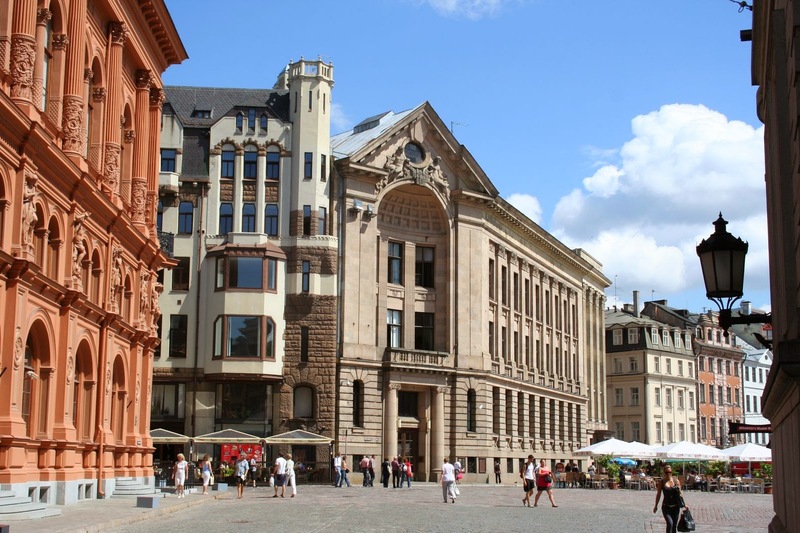 It was eight years after the collapse of the Soviet Union, which Latvia was forced to join in the 1940′s. And it was five years before Latvia chose to join the European Union. When one first arrives at a city, late in the evening, it is not always possible to find a suitable hotel; you take whatever you can get to rest your weary head. I'd taken the bus from Parnu in Estonia to Riga, in Latvia, which took about three hours. The first hotel I stayed in turned out to be a 'rip off, the Hotel Latvija*, which in Soviet days was something rather special. But it cost a fortune to stay there and the service was not good. A smile would have been nice. But the staff looked stern and hostile. Anyway, I was pleased the next day to find a much better hotel, the Hotel Laine at Skolas 11. It was a fraction of the price, with a room twice the size and twice as nice. Furthermore, the staff were so friendly; when I missed breakfast one day, they gladly brought up a fantastic tray of food to my room! Now, that is what I call service... And on the next day when I did rise in time for breakfast, it was served on a wonderful roof garden. I know that Estonia and Latvia seem quite eager to join the European Union, but the average wage here is so low compared to Western Europe that I really can't see how people survive. And it does seem so odd when there are so many flash cars around, brand new BMWs and Mercedes; and it seems that every third person has a mobile phone. Something doesn't quite add up. Can anyone explain that for me? However, I am told that most of the marriages made in this way do not last longer than around five years. Can that be true? The girls here wear mini-skirts so short that I hardly think there is much point putting them on! 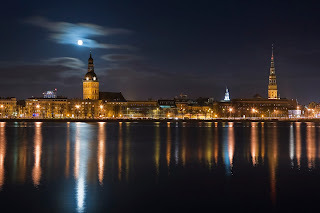 Riga moves on a mass of tanned slim striding legs of pretty girls. Yes, I have to confess, it is quite a distraction. The night clubs are bursting and the Old City is bustling almost through the night. 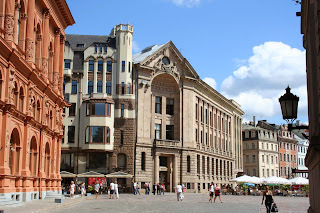 How lucky the ex-Soviet countries are to still have their old parts of the city intact. There would surely be no visitors without them. The new parts of the city are not exactly marvels of architectural splendor.. 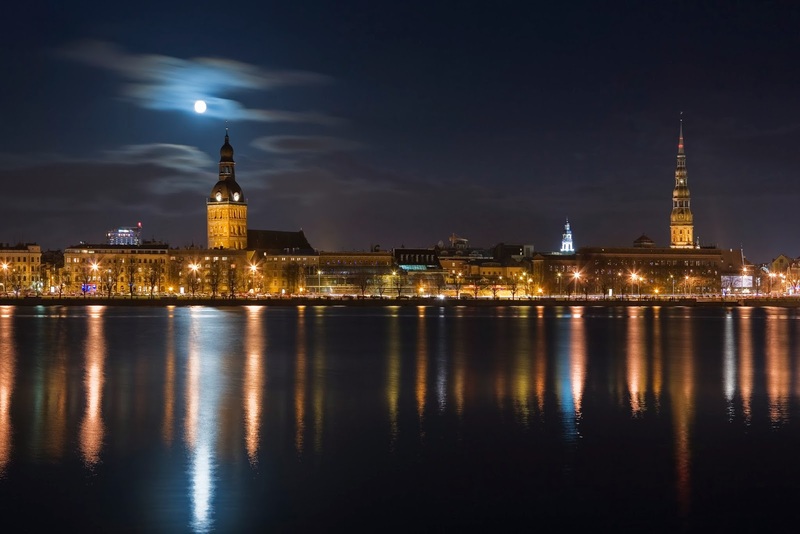 But there is amidst the optimism and bright faces of Riga much apparent poverty. It is so sad to see old or handicapped people just sitting listlessly at 1am with their hands sticking out as the Old City party revellers smilingly stride from night club to night club.. I can't imagine that they ever get any money in their little tins or in their pitiful hands. One old, blinded, puckered woman, who stands hunched with hand outstretched during the day, is just a bundle of tattered clothing in the middle of the night, lying in exactly the same spot, by the doorway as the discos blare around her. Who would dare or care to hug such a woman? Was she once a young party reveller in a short skirt? The other evening, over a late dinner at 11 pm, a little girl, bold as brass but with the saddest face, came right up to the dinner table inside the restaurant with a bunch of flowers. She was Russian and wanted 3 lats for her flowers (about 3 British pounds). She said to my Russian friend that her mother will beat her if she doesn't sell the flowers... I of course can't understand a word of what is being said. The little girl is almost crying as she is talking, and my friend has a tear in her eye, even though she tells me that she couldn't possibly sell those flowers for 3 lats. I ask how old she is...she is 8 and also has a (younger?) brother roaming the streets trying to get money in this way. The little girl is extremely persistent. She is not going to leave the table. I offer her one lat and say she can keep the flowers and sell them to someone else. Over the next few days, I have seen her several times, with her blonde hair, colourful red dress and such a worried looking face, going from restaurant to restaurant, blurting out a stream of Russian words with the same story each time...her mother will beat her if she doesn't sell the flowers. My friend tells me that the story is probably true. I asked if there were not laws or organisations that could help....in Britain surely this girl would be taken into care. My friend shrugs her shoulders. 'But this is Latvia,' she says in her Russian accent which also has a tinge of American-English. Walking to the old part of the city yesterday, I saw a bedraggled, but intelligent looking man, wearing John Lennon glasses, with his three dogs, his head bowed, eyes closed as if in prayer, with his hand outstretched, hopeful for some loose change, surrounded by his dogs, with one little dog lying snugly on top of the other dog, about four times its size. Probably a few years ago I wouldn't have hesitated to have photographed such a scene; it looked sad, odd and compelling. But nowadays, to actually point my camera lens at such pavement poverty seems such an intrusion. As I waited for a free bus to take me to the luxurious Radison hotel for a swim, an old woman lay awkwardly outstretched, sprawled across steps near to a monument celebrating freedom and independence. Her head was obscured by clothing and her skirt was only half draped across her legs, revealing more than anyone would really want to see. One leg was bent but absolutely fixed in place. It was broad daylight. She did not move. Actually, it crossed my mind that she was dead. It really did look like rigor mortis had set in. Was I supposed to do anything about this? A flurry of troubled thoughts flooded my mind as I walked around the monument, half looking out for my bus, half taking a glance across to the 'dead' woman. Freedom Monument: did I see a dead woman? Had she moved in the last five minutes? No, she had not. So, if she was dead, what could I do about it? And if she wasn't dead, what could I do about it? Had anyone else noticed? No, they hadn't. But hold on, yes, two women look towards her and start saying something to each other in Russian. I walk around the monument again. Still, she has not moved one inch. Can this be right? Could a woman lie dead in the middle of a European capital city and no one do anything about it? The other day in the internet cafe I met two old men, one of whom was talking in a strange American-English accent to a young man across the room. One of the old men has a flock of white hair with deeply ingrained huge wrinkled dents in his face and looks much older than the other old man, who somehow looks better weathered. So, I start to talk to them. The younger looking older man actually turns out to be five years older than the other.. I wonder why he doesn't look it, but of course that isn't a question I ask. The answer just comes out in their story. The older man escaped from Latvia to the United States when he was only 16, just as the Second World War was gathering pace. His father had warned him that Germany would lose the war.. the whole world was against Germany and surely the war would only go on for a few months, at the most. They had absolutely no idea that it would go on for years. So, he escaped by ship. He went to Russia. Then to Scotland And then eventually to the USA, where he has lived for the last 60 years. But his brother, who was only 11, didn't get away. He has lived in Latvia all his life. And it has been a hard life. Now, he is living on his pension of just 60 or so lats a month. It is not easy to make ends meet. Oh, and this is my son, says the older luckier man, introducing me to a strapping tall man of around 35. 'Did you get my stock prices on the internet?' he asks his son, whilst adding to me that he has made quite a lot of money on a variety of shares. His younger, poorer, older looking brother, looks and listens, with glassy resigned eyes..
Latvia has changed a lot since the Soviet days, says the man. But he wouldn't advise investing here, he says. There is a lot of trouble. The mafia take 10 per cent of all business takings, he continues. There are gangs. If you leave your car, it will get stolen. If you leave your house, it will get robbed. It may take 10 years before there is more stability here. And, when Latvia gets rich again, probably the Russians will come back. That of course is the big question. Will the Russians invade again? I talk about the Russians here without resident passports. They can't get a residents passport unless they learn Latvian, but many only speak in Russian. Oh, they can speak Latvian OK, says the old man. But they don't want to. It is to do with pride. Maybe, I wonder to myself, much danger lurks within the minds of proud people. What do you think? Am I touching on forbidden subjects? *Since my trip in 1999 just prior to Latvia joining the European Union, the country is now a full member and will soon have the Euro too instead of Lats. When I recently visited Riga again, the city had seemed to have many more cafes and restaurants and boutique hotels. The Soviet style Hotel Latvija is now part of the Radison Group and has undergone a complete transformation, becoming one of Latvia's premier upmarket hotels.. It just shows what can be done.